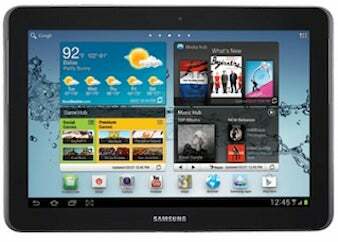 Samsung's Galaxy Tab 2 10.1 is set to go on sale at retailers nationwide Sunday for $399.99, furthering the variety of tablet sizes from the vendor. The new tablet runs Android 4.0, or Ice Cream Sandwich, and features a 1 GHz dual-core processor. It has 16GB of internal storage, with a microSD card slot for storage expansion of 32 GB. The 10.1-in. display (1280 x 800 pixels) is one of the bigger screens available today. The new iPad, the most popular tablet on the market, is 9.7-in. and starts at $499 for a 16 GB Wi-Fi-only version. The Samsung Galaxy Tab 2 10.1 price tag of $399.99 for a Wi-Fi version nearly matches the $399 starting price for the Wi-Fi-only iPad 2 with 16GB. Samsung has offered a range of tablet sizes, including the Galaxy Tab 2 7.0 at 7-in., but promotes the larger 10.1 display as making movies and games "more exciting." Retailers for the 10.1 include Best Buy, WalMart and Office Depot, Samsung said. IDC said Samsung had 6.3% of the tablet market in 2011, just behind Amazon Kindle Fire, at 6.9%, and the iPad at 58.9%.